I’ve experimented with Pinterest by creating a board of influences, eras, themes, and images drawn from my life. This has been a great day. Every last vestige of winter is gone. I saw a gaggle of adorable ducklings with their mother on the Connecticut River. I went for two long walks. Visited the fundraiser rummage sale for the Guildhall Elementary School Parents’ Group. I bought four tomato plants and a glass of lemonade at Phil Nelson’s store across the street. 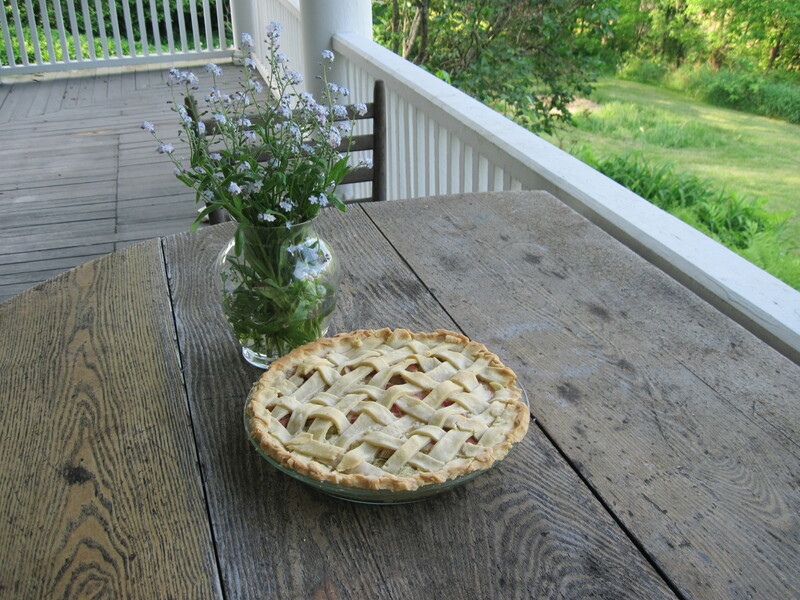 And then I made a rhubarb pie, using the rhubarb from my garden, which was finally harvestable. There’s nothing like baking a rhubarb pie. 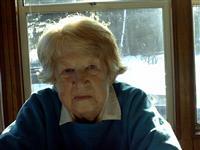 Elizabeth (Hubbard) Odell passed away last weekend, on May 13, at the age of 94. Her funeral and burial service were held today, and there was a reception for her at the historic Guild Hall here in town. By the time I arrived in Guildhall 7 years ago, Mrs. Odell had already retired and moved to Lancaster, NH. So I’ve never actually met her. But from the moment I became Town Clerk, I was aware of her virtual legendary status. I had many opportunities in my then-job as Guildhall Town Clerk to reflect on Mrs. Odell’s character and her competence, because she was a predecessor of mine. She was the Guildhall Town Clerk from 1971 to 1990 and for part of that time, served as Town Treasurer, as well. There were many occasions when I’d be deep in land records research or recording, only to stumble across the work of Mrs. Odell. She was meticulous and utterly professional in everything she did, and left the Guildhall Land Records and vital statistics in extraordinarily good shape at the end of her tenure. Many of my friends and neighbors in town talk about how hard Betty worked and how painstaking she was in her recordkeeping. In a very short time, I came to understand that she was a hard act to follow, both as Town Clerk and Treasurer. Whenever I had a recordkeeping challenge, I’d often smile and ask myself what Betty Odell would do. As I learned more about Mrs. Odell, my admiration only increased For her time, she was an extraordinarily independent, professional woman. After graduating from high school, she had the guts and courage to move to Massachusetts on her own, without being married. She got herself an education, taught school and carved out work and career for herself. She didn’t marry until she was in her late 30s. When she married, she became a mom. 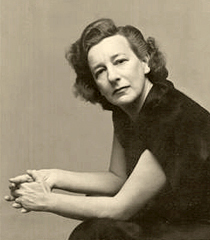 During her life, she managed to effectively balance both career and family. She came back to Guildhall in the early 1970s, to help her mom at the Old Crawford Homestead. And she devoted herself to her sister Helen Boswell. Rest in peace, Betty Odell. We remember and admire you. There has been some good news. Most of us in Guildhall Village had two full days of uninterrupted internet service over the weekend. (Although the Town offices and the Sheriff’s building were still without service.) And it appears that NCIC and EZNorth staff have started communicating much better with customers. But the bad news is that everyone’s service went down again last night at approximately 9pm. To the best of my knowledge, there’s no NCIC service at any Guildhall village residence, business, or county or municipal service. Once again, I’m writing this blog post from Weeks Memorial Library in Lancaster, NH. I’ll repeat: I’m a huge supporter of NCIC and their mission to promote jobs and economic development. I’d rather give them my money than to some corporate satellite conglomerate. But how long can we go on like this? EZNorth Wireless and NCIC: Is the Broadband Honeymoon Over? My last blog post was hopeful and optimistic. True broadband had come to our corner of Vermont, which we all considered a significant step forward in bringing badly needed telecommunications to our historically underserved region. Previously, most of us had been limited to dialup and the more expensive satellite service. Everyone knows that dialup is unacceptably slow, but satellite was only marginally better in terms of speed. And satellite had other problems, including periodic (albeit short) outages due to weather and limited bandwith. Wireless Linc, a project of the Northern Community Investment Corporation (NCIC) and EZNorth, promised fast and reliable service. NCIC is a non-profit that receives federal stimulus and state money, with a mission to foster economic development and jobs in the North Country of Vermont and New Hampshire. We were all very excited when NCIC announced its intention to place a tower across the river in Lancaster and then mount radio signal boxes in the cupola of the Guildhall Public Library. Many in Guildhall signed contracts with the new provider. The telecommunications future looked suddenly a lot brighter. The EZ North/NCIC track record so far? Unfortunately, EZ North has encountered some serious problems in its own infrastructure. On Friday May 4, after about six weeks of relatively decent (although not perfect) service, almost all Guildhall residents, businesses and town government lost their internet connections. A few locations experienced spotty on-and-off- again restoration. For example, my house had service for a full 12 hours early in the week, and my law office had service for 2 hours this morning. But for the most part, we in Guildhall Village and outlying areas have been on an internet blackout for one entire week. Yes, one whole week, and the problem hasn’t been resolved yet. In spite of dozens of calls and emails to the provider, no one is still quite sure what has gone wrong with the EZ North system. Many of us get the impression that most of the EZ North and NCIC staff aren’t really sure what happened, either. One measure of any utility provider’s competence is not the frequency of outages, but how effectively personnel manage the affected customers during the outage. Although things got a little better over the last couple of days, for the most part, EZ North gets a poor grade for customer service. There has been no comprehensive effort to communicate with customers about the scope or reasons for the outage. No notice was posted on the organization’s website (not that many of us would have been able to see it anyway!). For most of this week, most customer messages and emails went unanswered. No EZ North representative has been able to articulate, with any specificity, what has gone wrong, and what the plan and timetable might be for getting us all back online. Like most of my neighbors, I’m a huge NCIC supporter. I would frankly prefer to give my money to NCIC than some distant corporate satellite service. I think the NCIC project has enormous potential. But as the clock ticks into our second week of internet outage, NCIC and EZ North are taking serious risks, both to their cash revenues and their credibility in the North Country. If you’re reading this post, are a local affected customer of EZ North, please call the following numbers to let them know of your dissatisfaction. They need to hear from us! EZ North Customer Service Line: 802-553-7361. Northern Community Investment Corporation, Lancaster, NH: 603-788-2700. Ask for Susan Wheeler or Jon Freeman.